Will we ever have cyborg brains? Over at BBC Future, computer scientist Martin Angler has put together a provocative piece about humanity's collision course with cybernetic technologies. Today, says Angler, we're using neural interface devices and other assistive technologies to help the disabled. But in short order we'll be able to radically enhance human capacites — prompting him to wonder about the extent to which we might cyborgize our brains. Angler points to two a recent and equally remarkable breakthroughs, including a paralyzed stroke victim who was able to guide a robot arm that delivered a hot drink, and a thought-controlled prosthetic hand that could grasp a variety of objects. Yet it's still a far cry from the visions of man fused with machine, or cyborgs, that grace computer games or sci-fi. 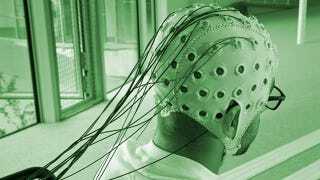 The dream is to create the type of brain augmentations we see in fiction that provide cyborgs with advantages or superhuman powers. But the ones being made in the lab only aim to restore lost functionality – whether it's brain implants that restore limb control, or cochlear implants for hearing. Creating implants that improve cognitive capabilities, such as an enhanced vision "gadget" that can be taken from a shelf and plugged into our brain, or implants that can restore or enhance brain function is understandably a much tougher task. But some research groups are being to make some inroads. For instance, neuroscientists Matti Mintz from Tel Aviv University and Paul Verschure from Universitat Pompeu Fabra in Barcelona, Spain, are trying to develop an implantable chip that can restore lost movement through the ability to learn new motor functions, rather than regaining limb control. Verschure's team has developed a mathematical model that mimics the flow of signals in the cerebellum, the region of the brain that plays an important role in movement control. The researchers programmed this model onto a circuit and connected it with electrodes to a rat's brain. If they tried to teach the rat a conditioned motor reflex – to blink its eye when it sensed an air puff – while its cerebellum was "switched off" by being anaesthetised, it couldn't respond. But when the team switched the chip on, this recorded the signal from the air puff, processed it, and sent electrical impulses to the rat's motor neurons. The rat blinked, and the effect lasted even after it woke up. Be sure to read the entire article, as Angler discusses uplifted monkeys, the tricky line that divides a human brain from a cybernetic one, and the all-important question of access.